After raising my children and having decades of lugging all the "stuff" around Disney Parks, I'm looking forward to traveling a bit lighter from here on out. I'm intrigued by the thought of minimalist travel gear and how I can downsize my massive "mom bag" into a wristlet or maybe even get rid of carrying bag all together. Minimalists know that using multi-functionality combined with modern Disney amenities can make days easier and the load a little lighter. 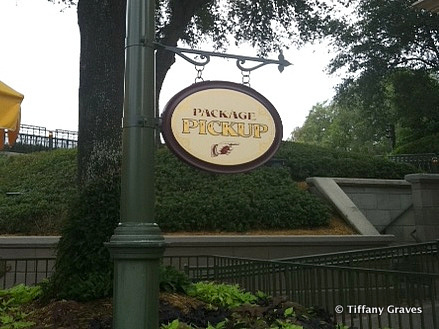 Read on for tips to minimize the stuff you carry at Walt Disney World! Start out by layering your wardrobe; several thin layers on top paired with cargo pants make for a fast and base for your minimalist ensemble. Consider making your top layer a windbreaker that can fold down into a small size that you can stuff in a pocket of your cargo pants to take you through the daily temperature changes. Make liberal use of technology, embracing the full MyMagic+ experience that a Walt Disney World Vacation offers. 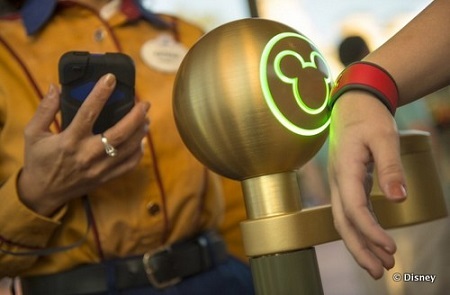 By setting up a room charge and pin number for your MagicBand, a Disney minimalist knows that carrying currency is unnecessary, their park tickets, room key, and charge card are all accessible with the touch of their wrist. This means that they can leave their wallet locked up in their Walt Disney World Resort in-room safe for the day. Use your smartphone loaded with the MyDisneyExperience App to have all the Park information you need to know in the palm of your hand. From there you can manage your FastPass+ and Dining Reservations, as well as discovering the wait times for attractions, entertainment schedules, and viewing a general Park map. Folks using ApplePay have another for of payment available here if you don't want to charge to your room. How many MagicBands have you collected? Got your smartphone? Then you've also got your camera! The quality of camera photography has gone way up in recent years with the ability to take high-resolution photos and video. Snap images of those unforgettable moments without having to carry around extra gear. However if you want to up your game - check out adding a specialty lens to your iPhone. You'll need to keep a photo ID on you, so consider a Truffol Wallet iPhone Case (or any wallet style phone case) so that you can simply slip your ID (and an extra credit card if you'd like) right into the back of your phone. However going the wristlet route, I'll just slip my ID inside of it. Pick Disney dining locations where you can plug in and recharge electronics during you meal. If you scout out Disney quick service seating areas, you're likely to find several electrical outlets scattered throughout the room. 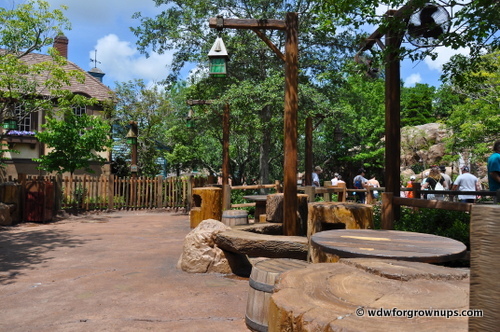 At the Magic Kingdom you can also head over to the Tangled Rest Area, where charging ports are hidden in tree stumps. If you don't mind a little extra weight, consider buying a small back-up battery and tucking it into another pocket on your cargo pants. Staying at a Walt Disney World Resort? Make use of the Disney transportation system and eliminate the need for car key. Your room key is right on your wrist. Lighten your load by not carrying a first aid kit. Minimalists know if they need a Band-Aid or some baby powder that they can stop in at one of the fantastic Disney Parks First-Aid locations. Keep bag free by using Disney's package delivery. In Park purchases can be sent to the front of the Park for later pick-up, or to your Walt Disney World Resort for next day pick-up. What does all that chatter minimize down to? Looks good to me - Let's hit the Parks! If you just won't feel prepared leaving a big bag behind, consider sticking your regular day bag stocked with all those the "just in case" items in a locker for the day. That way you have it right there in the Park for emergencies, but you don't have to carry it around. Do you have any minimalist tips for touring the Disney Parks? Leave a comment below and share your secrets! I just returned from a 4 day weekend. I stayed on-property with my adult daughter. I carried my cell phone that has a case capable of holding cash and photo ID. I had my magic band with charging privileges. That's it! When I needed something to sit on (while waiting for fireworks) I asked a WDW hostess for a plastic bag. When I started to get a major headache I went to First Aid (in all parks) and was given a dose to take immediately and an extra dose if I needed it later...I was also encouraged to drink more water as dehydration is a leading cause of headaches. Walked over to Starbucks and requested a large cup of ice water...free! Nope, didn't need a big bag...hands free all day! Thanks Disney..see ya real soon. Camelbak backpack allows me to carry 1.5 liters of necessary water. As a teacher, it's very rare to go anytime but the HOT summer months & the Camelbak is #1. I can ask for cups of ice or ice water & refill. In the backpack we carry: sunscreen, indiv. pckgs of wet wipes, eye glass cleaner wipes (works on phones too), bug bite cream, ponchos if it looks like heavy rain, cell phone charger, extra ziplock bags (for phones when it rains) & a long sleeve light weight shirt (cold bus rides from MK to AKL are not fun. 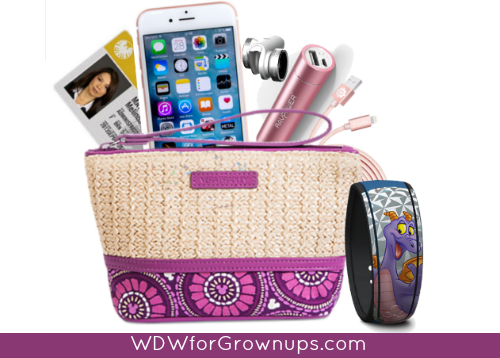 I wear the smallest Vera Bradley mini-hipster for my ID, lip balm, some Disney VISA & DVC card for discounts. I can put it in the backpack when needed. Sunscreen for face, lips & body are a must!! Great stories and suggestions! I love the camelback idea. Thanks everyone! In the small backpack, I carry my hooded windbreaker (for rain), a cell phone charger (when an outlet isn't readily available) and a cord (when an outlet is available), my Sorcerers of the Magic Kingdom ('cause you never know if you'll park hop by to MK), and a couple of Vinylmations (in case I see someone trading them).